Heat the olive oil in a wok or pot and brown the chicken pieces until lightly golden on all sides. Meanwhile, in two separate pots, cook the noodles and broccoli for 4-5 minutes. Drain both and set aside. While the chicken, broccoli and noodles are cooking, whisk together the ingredients for the sauce and set aside. 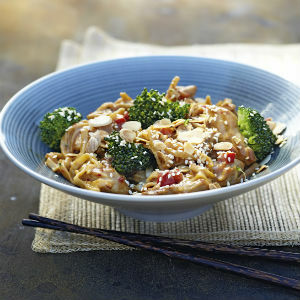 Pour the noodles into a warmed serving bowl, add the chicken and broccoli, drizzle with the sauce and then add the red pepper, coriander, sesame seeds and toasted almonds (if using). Serve immediately in warmed bowls. Note: Add the sauce just before serving, as it tends to get absorbed by the noodles and can become dry. To visit Sarah Graham's blog, click here.